Put everything into a large pot. Bring to a boil. Skim foam off the top. Reduce heat, cover & simmer for 3 hours. Strain using a fine sieve or cheesecloth-lined colander. Pick and reserve any meat left on the bones. Discard bones and vegetables. Refrigerate broth overnight. All the fat will solidify on the top for easy removal. Taste for salt. 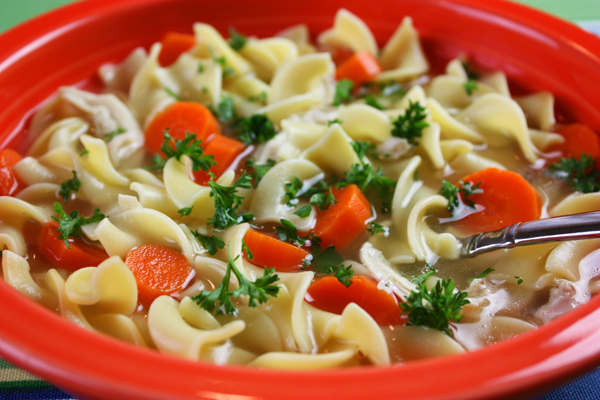 Note: To make chicken-noodle soup, bring broth to a boil, add noodles and freshly diced carrots and cook until done. Stir in reserved chicken pieces. Garnish with parsley if desired. 9 Comments on "Homemade Chicken Soup"
I love your timers – especially the cow one. Where do you get them ??? Do you freeze your chicken stock? I’ve found that a good way to freeze it is in ice cube trays and then take them out when frozen and put in freezer bags that way you’ve got a tablespoon or two in each cube then every time I need a cube I just take out as many as I need for my recipe. Have a good day all. I freeze mine the same way. I’m certainly going to try both of your stocks, beef and chicken, way to much sodium in the store bought brand. anyways what I would like to know is that you said to use the same recipe for both broths, but the beef has garlic and the chicken didn’t. Did you forget to add it in the ingredient list for the chicken stock or does it not go in? I don’t put garlic in my chicken stock because I don’t want to over-power the taste but you certainly can include it. I am a fan of home made stocks. My freezer is ‘stock’ full. I like roasting the meat and vegetables before boiling. To save energy I use my pressure cooker. I make chicken/turkey meatballs, freeze and give to my daughter, both parents work. In a dash, she just add frozen veg and noodles. My grandsons love this soup, believe it or not, over McD. 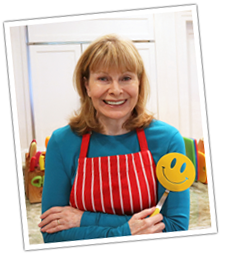 Hi Jenny , I really enjoy your recipes . They’re so down to earth and healthy. I was wondering if the noodles get to soft, while cooking them together with the carrots, since the noodles take less time to cook . When I had made soup, I had cooked the noodles separately and put them in the bowl along with the broth and vegies , but I like your idea better ( of course ). I just need your opinion since your’re the Pro . My noodles (both fine and wide) take 7-8 minutes to cook and that’s enough time for carrots to cook as long as you don’t cut them too big. I slice them no more than 1/4-inch thick and they turn out every time. I used to cook the noodles separately and the carrots too but they both taste so much better when cooked in the broth, especially the carrots.